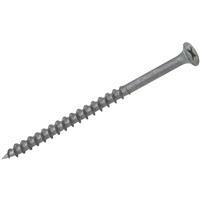 Can be used for drywall, hardware, plywood, composition, and softwood. Sharp point, hardened steel, coarse thread with a No. 2 Phillips recess, bugle head. Phosphate finish. For interior use.